Baba Bhagwant Bhajan Singh Ji was born to Mata Niranjan Kaur in the house of Sant Sant Baba Jaswant Singh Ji in 1953 in Amritsar. His childhood was spent under the spiritual and religious guidance of his father. Throughout his childhood he was gentle, easygoing and he took pleasure in the simple things in life. His father's spirituality brought him into the company of many holy saints, and their teachings attracted him towards the service of the Gurus and the Naam Sim ran. Baba Bhagwant Bhajan Singh Ji was educated at the Sacred Heart School in Amritsar and at the Sant Singh Sukha Singh Senior Secondary School in Amritsar. 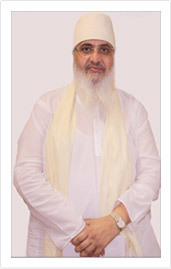 He obtained his higher education at the Khalsa College in Amritsar. He was educated in Divinityby Sant Sunder Singh Ji 'Nirmale - Katha Wale'. Sant Sant Baba Jaswant Singh Ji and other holy men recognisied his innate spiritualism and prophesied that Baba Bhagwant Bhajan Singh Ji would be anointed as the next Sant. After the death of Sant Baba Jaswant Ji, the service of Nirmal Takhat Talab Baba Budha Sahib Ramdas was handed over to Baba Bhagwant Bhajan Singh Ji and the Tilak ceremony was performed on the 25th December, 1973 by Mahant Pandit Sucha Singh Ji, Nirmal Panchaiti Akhara and Kankhal Haridwar from Nirmal Bhekh Bhushan.